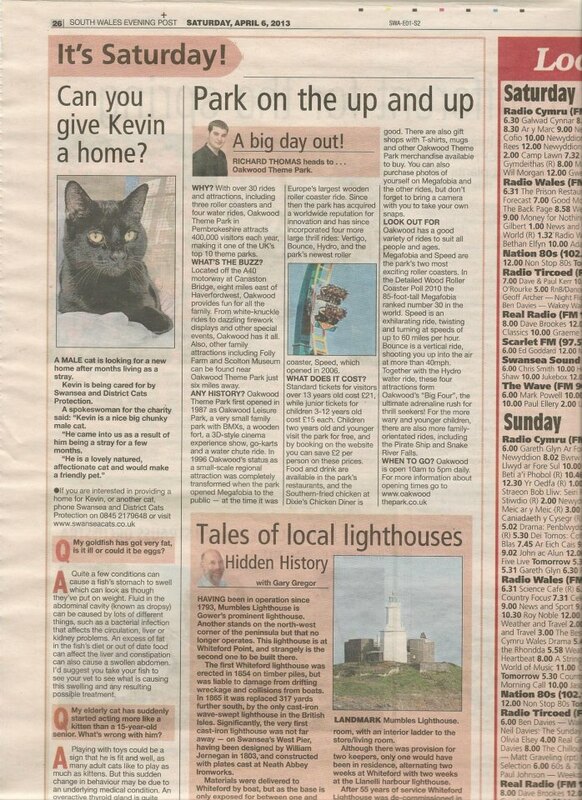 Below is my “Big Day Out” column from the Saturday, April 20, 2013, Swansea edition of the South Wales Evening Post. 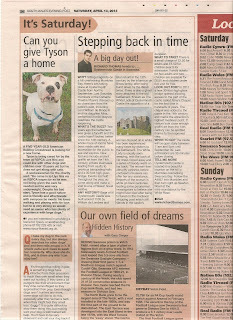 RICHARD THOMAS heads to Margam Country Park. WHY? Steeped in history, wildlife and natural beauty, there’s something for everyone inside the park. Located in Port Talbot, along the eastern rim of Swansea Bay, the 850 acre estate boasts a magnificent 18th century orangery, picturesque Tudor-Gothic style Victorian mansion house, a 12th century chapter house, ornamental gardens and one of the best deer herds in Wales. Children will enjoy the narrow gauge railway, adventure playground, farm trail and Fairytale Land. Borrow an mp3 player free of charge from the kiosk and you’ll be able to eavesdrop on voices from the past when you visit eight different spots inside the park. Written by David Hughes and recorded by local actors, these echoes from the past offer a fascinating insight into the lives of people who have worked, visited or lived on the estate over the centuries. WHAT’S THE BUZZ? Next month Margam is set for a £2 million restoration of park's historic features. Historical core improvements will be carried out to the Broadwalk, Castle and Orangery terraces, the Temple of Four Seasons, the Ivy Cottage, the Japanese Garden, the ha-ha and water features. The park’s Citrus House has already been restored at a cost of £900,000 where visitors can get a taste of what to expect. ANY HISTORY? The Citrus House was built around 1800 to replace earlier greenhouses on the estate. The building was originally referred to as the “Orange Wall” rather than the Citrus House. In 2007 the glasshouse fell into disrepair and deemed too dangerous for public access. With the help of a grant from The Rural Development Plan the Citrus House has now been painstakingly restored to its former glory. LOOK OUT FOR? The 44.5m long Citrus House. The fabulous glass building is climatically controlled with state of the art equipment to enable a variety of common and rare citrus plants to grow. FUN FACT? Working in this warm atmosphere, it is easy to imagine that the gardeners who worked in the Citric House in the 1800’s had a relatively comfortable time, especially during the winter months. Unfortunately, the arsenic and other chemical sprays the Victorians used to kill the unwanted insect life in their glasshouses meant that the lives of these gardeners were also short. WHAT TO TAKE? Entry to the park is free but there is a charge for parking and some of the activities inside. Parking charges are £4 for cars, £6.90 for minibuses, and £13.70 for coaches. Bring a camera with you to take some snaps. WHEN TO GO? Margam Park is open most days between 10am to 6pm. TELL ME MORE: Throughout the year the park hosts various events from Living History Weekends to clown festivals and charity walks. 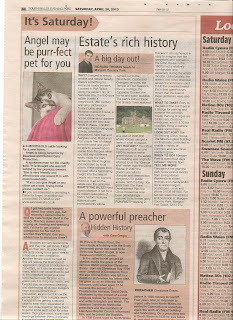 Go to www.margamcountrypark.co.uk and phone 01639 881635. For sat-nav users the address and postcode is: Margam Country Park, Margam, Port Talbot, SA13 2TJ. 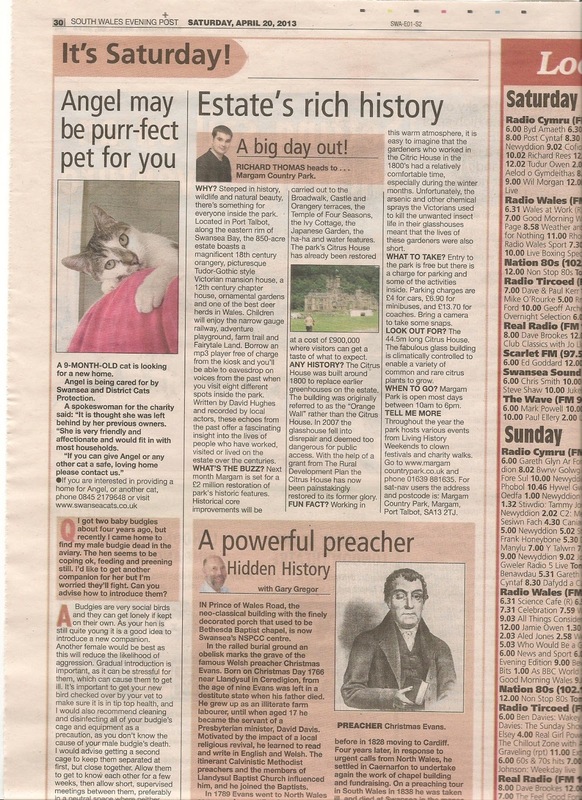 Below is my “Big Day Out” column from the Saturday, April 13, 2013, Swansea edition of the South Wales Evening Post. RICHARD THOMAS heads to Oystermouth Castle in Swansea. WHY? Sitting magically on a hill overlooking Mumbles Bay, there's lots taking place at Oystermouth Castle from April to September. Last Saturday members of the Ostreme Theatre Players dressed up as characters from the castle's past, including Lord William de Braos III and his daughter Alina, performed in mini plays to celebrate the castle reopening. WHATS THE BUZZ? Two years ago the battlement was given a facelift and the castle hasn't looked better since the 14th century. A whole maze of rooms have been made safe and accessible for the public to see and explore. New features include ancient graffiti art from the 14th century, private staircases leading from vaults to previous banqueting halls and a 30 foot high glass bridge. Events are held throughout the year, so come along and make a visit to one of Wales’ finest castles. ANY HISTORY? Oystermouth Castle was built around 1100 by William de Londres and later rebuilt in the 13th century by the infamous de Breos family, after being burnt down by the Welsh twice. There is also a ghost story attached to the old battlement. Known as The White Lady of Oystermouth Castle the apparition of a woman dressed all in white has been experienced many times by visitors to the battlement. The White Lady is usually seen weeping, with the back of her dress ripped away and a series of bloody welts on her back. The woman then abruptly vanishes before confused onlookers can offer her any assistance. Reports of the woman in white go back centuries, leading some paranormal investigators to believe she might have died after being tortured on the medieval whipping post which still stands in the castle’s dungeon. WHAT TO TAKE? There is a small charge of £2.50 for adults and £1.50 for children over 5 for admission. Family tickets for two adults and two children are available for £6.50 and children under five visit for free. Remember to bring cash with you as there are no credit/debit card facilities on the castle site. Also wear suitable footwear for the uneven terrain. LOOK OUT FOR? In 2011 a new 30-foot-high glass bridge opened allowing access to the part of the castle called Alina's Chapel for the first time in hundreds of years. The chapel was added to the castle in the 14th century and marks the attraction’s highest medieval point. If visitors look close enough graffiti art from the 14th century can be spotted thanks to the improved view. WHEN TO GO? The castle will be open daily between 11am and 5pm until 30 September. Last admissions are 30 minutes before closing. TELL ME MORE: Oystermouth Castle is located in a beautiful location on the hill in Mumbles overlooking Swansea Bay. Follow the A4067 into Mumbles and then turn right up Newton Road at the mini-roundabout by the White Rose. The castle is halfway up Newton Road on the right hand side. For sat nav users the castle’s postcode is SA3 5TA. Phone 01792 635075 or visit www.oystermouthcastle.wordpress.com for more information. 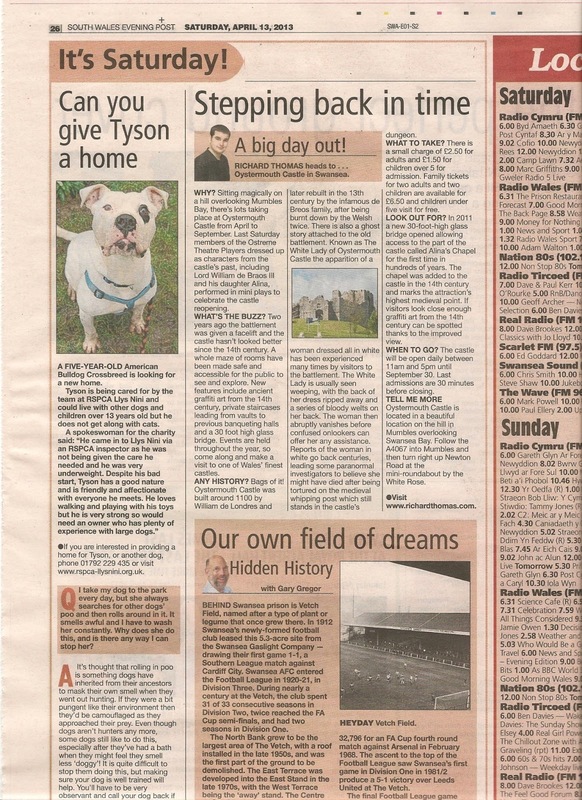 Below is my “Big Day Out” column from the Saturday, April 6, 2013, Swansea edition of the South Wales Evening Post. RICHARD THOMAS heads to Oakwood Theme Park. WHY? With over 30 rides and attractions including three roller coasters and four water rides, Oakwood Theme Park in Pembrokeshire attracts 400,000 visitors each year, making it one of the UK's top ten theme parks. WHAT’S THE BUZZ? Located off the A40 motorway at Canaston Bridge, 8 miles east of the town of Haverfordwest, Oakwood park provides fun for all the family, from white knuckle rides to dazzling firework displays and other special events Oakwood has it all. Also other family attractions including Fully Farm and Scolton Museum can be found near Oakwood Theme Park, just six miles away. ANY HISTORY? Oakwood Theme Park first opened in 1987 as Oakwood Leisure Park, a very small family park with BMXs, a wooden fort, a 3D-style cinema experience show, go-karts and a water chute ride. In 1996 Oakwood’s status as a small-scale regional attraction was completely transformed when the park opened Megafobia to the public. At that time Europe's largest wooden roller coaster ride. Since then the park has acquired a worldwide reputation for innovation and has since incorporated four more large thrill rides: Vertigo, Bounce, Hydro and the park’s newest roller coaster Speed opened in 2006. WHAT TO TAKE? Standard tickets for visitors over 13 years old cost £21, while junior tickets for children 3-12 years old cost £15 each. Children two years old and younger visit the park for free and by booking on the website you can save £2 per person on these prices. Food and drink are available in the park’s restaurants, the Southern-fried chicken at Dixie's Chicken Diner is good. There are also gift shops with t-shirts, mugs and other Oakwood Theme Park merchandise available to buy. You can also purchase photos of yourself on Megafobia and the other rides, but don’t forget to bring a camera with you to take your own snaps. LOOK OUT FOR? Oakwood has a good variety of rides to suit all people and ages. Megafobia and Speed are the park's two most exciting roller coasters. In the Detailed Wood Roller Coaster Poll 2010 the 85-foot-tall Megafobia ranked number 30 in the world. Speed is an exhilarating ride, twisting and turning at speeds of up to 60 miles per hour. Bounce is a vertical ride, shooting you up into the air at more than 40mph. Together with the Hydro water ride, these four attractions form Oakwood’s “Big Four”, the ultimate adrenaline rush for thrill seekers! For the more wary and younger children there are also more family orientated rides, including The Pirate Ship and Snake River Falls. WHEN TO GO? Oakwood is open 10am to 5pm daily. For more information about opening times go to www.oakwoodthepark.co.uk. 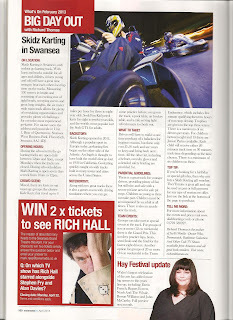 My column for the February 2013 issue of Swansea Life magazine. 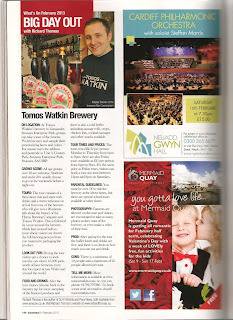 ON LOCATION: At Tomos Watkin’s brewery in Llansamlet, Swansea Enterprise Park, groups can take a tour of the famous Welsh brewery and sample their award wining beers and ciders. For sat-nav users the address and postcode is: Unit 3, Century Park, Swansea Enterprise Park, Swansea, SA6 8RP. CROWD SCENE: All age groups over 18 are welcome. Students and under 30s usually choose to go on the weekends before a night out. 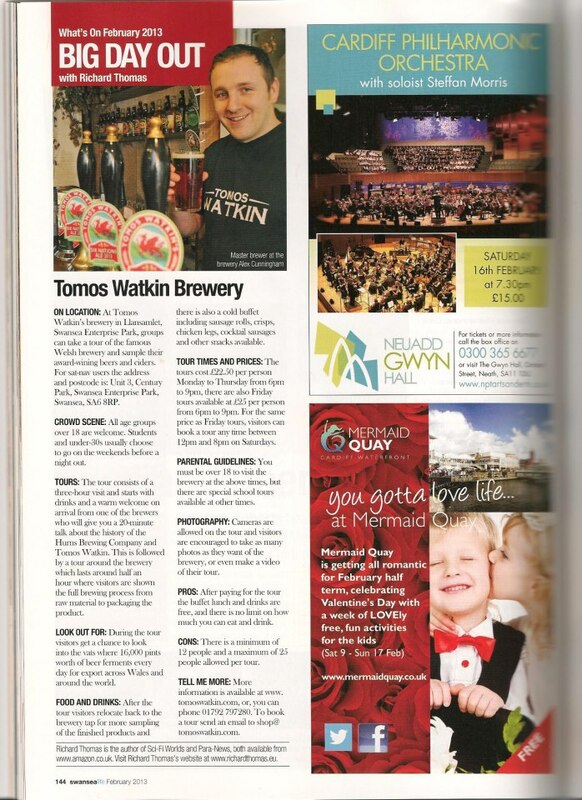 HISTORY: The present incarnation of Tomos Watkin was started in 1995 by Simon Buckley and first operated from a small brewery in Llandeilo, Carmarthenshire before moving to their current premises in Swansea Enterprise Park in 1999. The Hurns Brewing Company acquired the Swansea brewer in 2002 and today Tomas Watkin exports their beers and other beverages to countries around the world, including the United Arab Emirates, China, Singapore, France, and the United States. TOURS: The tour consists of a three hour visit and starts with drinks and a warm welcome on arrival from one of the brewers who will give you a 20 minuet talk about the history of the Hurns Brewing Company and Tomos Watkin. This is followed by a tour around the brewery which lasts around half an hour where visitors are shown the full brewing process from raw material to packaging the product. LOOK OUT FOR: During the tour visitors get a chance to look into the vats where 16,000 pints worth of beer ferments every day for export across Wales and around the world. FOOD AND DRINKS: After the tour visitors relocate back to the brewery tap for more sampling of the finished products and there is also a cold buffet including sausage roles, crisps, chicken legs, cocktail sausages and other snacks available. TOUR TIMES AND PRICES: The tours cost £22.50 per person Monday to Thursday from 6pm to 9pm, there are also Friday tours available at £25 per person from 6pm to 9pm. For the same price as Friday tours, visitors can book a tour any time between 12pm and 8pm on Saturdays. PARENTAL GUIDELINES: You must be over 18 to visit the brewery at the above times, but there are special school tours available at other times. PHOTOGRAPHY: Cameras are allowed on the tour and visitors are encouraged to take as many photos as they want of the brewery, or even make a video of their tour. STAFF: All the staff are dedicated and happy to answer any questions about the process. At the start of the tour chief brewer and tour guide Alex Cunningham hands out samples of the different varieties of malt the brewery uses to make their world famous beer. There is even a chocolate flavour to try. PROS: After paying for the tour the buffet lunch and drinks are free, and there is no limit on how much you can eat and drink. CONS: There is a minimum of 12 people and a maximum of 25 people allowed per tour. TOP TIP: Remember to drink responsibly, or, bring a designated driver with you. You can buy some bottles of the brewery’s beers and ciders to take home with you to enjoy later. TELL ME MORE: More information is available at www.tomoswatkin.com, or, you can phone 01792 797280. To book a tour send an email to shop@tomoswatkin.com. 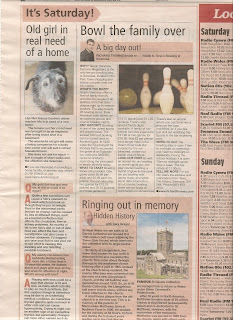 Richard Thomas is the author of Sci-Fi Worlds and Para-News, both available from www.amazon.co.uk. Visit Richard Thomas's website at www.richardthomas.eu. 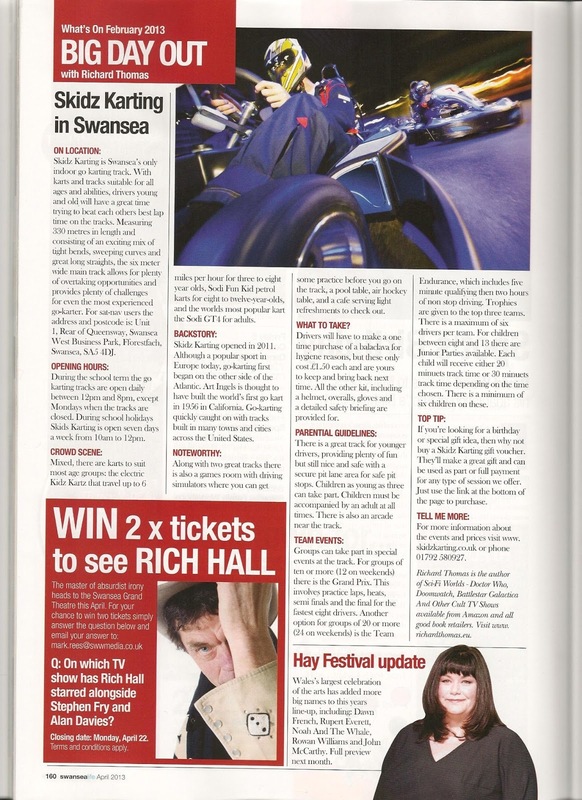 My column for the April 2013 issue of Swansea Life magazine. ON LOCATION: Skidz Karting is Swansea’s only indoor go karting track. With karts and tracks suitable for all ages and abilities, drivers young and old will have a great time trying to beat each others best lap time on the tracks. Measuring 330 meters in length and consisting of an exciting mix of tight bends, sweeping curves and great long straights, the 6 meter wide main track allows for plenty of overtaking opportunities and provides plenty of challenges for even the most experienced go karter. For sat-nav users the address and postcode is: Unit 1, Rear of Queensway, Swansea West Business Park, Fforest-Fach, Swansea, SA5 4DJ. OPENING HOURS: During the school term the go karting tracks are open daily between 12pm and 8pm, except Mondays when the tracks are closed. During school holidays Skids Karting is open seven days a week from 10am to 12pm. CROWD SCENE: Mixed, there are karts to suit most age groups: the electric Kidz Kartz that travel up to 6 miles per hour for three to eight year olds, Sodi Fun Kid petrol karts for eight to twelve year olds, and the worlds most popular kart the Sodi GT4 for adults. BACKSTORY: Skidz Karting opened in 2011. Although a popular sport in Europe today, go karting first began on the other side of the Atlantic. Art Ingels is thought to have built the world's first go kart in 1956 in California. Go karting quickly caught on with tracks built in many towns and cities across the United States. NOTEWORTHY: Along with two great tracks there is also a games room with driving simulators where you can get some practice before you go on the track, a pool table, air hockey table, and a cafe serving light refreshments to check out. WHAT TO TAKE? Drivers will have to make a one time purchase of a balaclava for hygiene reasons, but these only cost £1.50 each and are yours to keep and bring back next time. All the other kit, including a helmet, overalls, gloves and a detailed safety briefing are provided for. PARENTIAL GUIDELINES: There is a great track for younger drivers, providing plenty of fun but still nice and safe with a secure pit lane area for safe pit stops. Children as young as three can take part. Children must be accompanied by an adult at all times. There is also an arcade near the track. TEAM EVENTS: Groups can take part in special events at the track. For groups of ten or more (12 on weekends) there is the Grand Prix. This involves practice laps, heats, semi finals and the final for the fastest eight drivers. Another option for groups of 20 or more (24 on weekends) is the Team Endurance, which includes five minute qualifying then two hours of non stop driving. Trophies are given to the top three teams. There is a maximum of six drivers per team. For children between eight and 13 there are Junior Parties available. Each child will receive either 20 minuets track time or 30 minuets track time depending on the time chosen. There is a minimum of six children on these. TOP TIP: If you're looking for a birthday or special gift idea, then why not buy a Skidz Karting gift voucher. They'll make a great gift and can be used as part or full payment for any type of session they offer. TELL ME MORE: For more information about the events and prices visit www.skidzkarting.co.uk or phone 01792 580927. ABOUT THE AUTHOR: Richard Thomas is the author of Para-News, Sci-Fi Worlds and the UFO Files range of ebooks published by Bretwalda Books. For more information visit www.richardthomas.com. 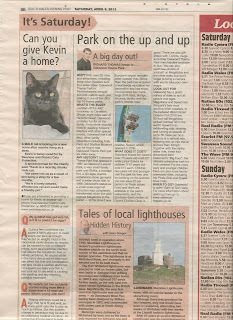 Below is my “Big Day Out” column from the Saturday, March 30, 2013, Swansea edition of the South Wales Evening Post. 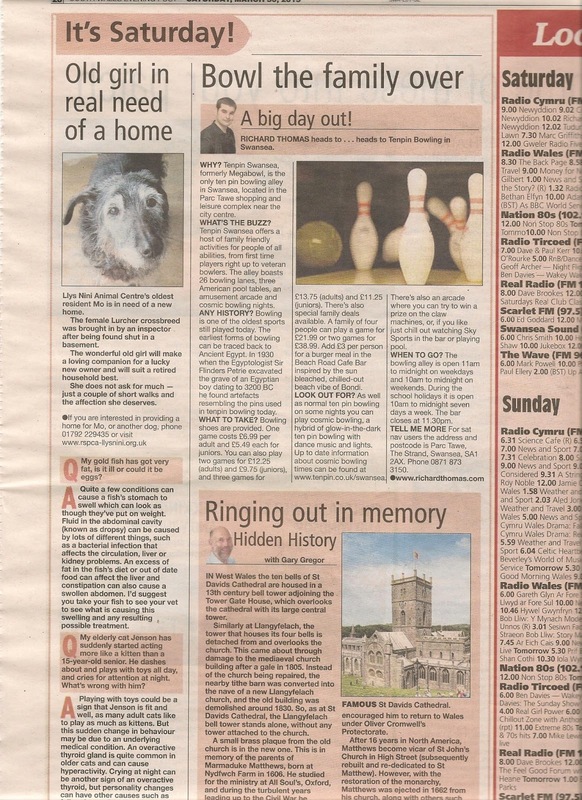 RICHARD THOMAS heads to Tenpin Bowling in Swansea. WHY? Tenpin Swansea, formerly Megabowl, is the only ten pin bowling alley in Swansea, located in the Parc Tawe shopping and leisure complex near the city centre. WHAT’S THE BUZZ? Tenpin Swansea offers a host of family friendly activities for people of all abilities, from first time players right up to veteran bowlers. The alley boasts 26 bowling lanes, three American pool tables, an amusements arcade and cosmic bowling nights. ANY HISTORY? Bowling is one of the oldest sports still played today. The earliest forms of bowling can be traced back to Ancient Egypt. In 1930 when the Egyptologist Sir Flinders Petrie excavated the grave of an Egyptian boy dating to 3200 BC he found artefacts resembling the pins used in tenpin bowling today. WHAT TO TAKE? Bowling shoes are provided. One game costs £6.99 per adult and £5.49 each for juniors. You can also play two games for £12.25 (adults) and £9.75 (juniors), and three games for £13.75 (adults) and £11.25 (juniors). There’s also special family deals available. A family of four people can play a game for £21.99 or two games for £38.99. Add £3 per person for a burger meal in the Beach Road Cafe Bar inspired by the sun bleached, chilled-out beach vibe of Bondi. LOOK OUT FOR? As well as normal ten pin bowling on some nights you can play cosmic bowling, a hybrid of glow-in-the-dark ten pin bowling with dance club music and lights. Up to date information about cosmic bowling times can be found at www.tenpin.co.uk/swansea. At Tenpin Swansea there’s also an amusements arcade where you can try to win a prise on the claw machines, or, if you like, you can just chill out watching Sky Sports in the fully licensed bar or playing pool on the three American pool tables. WHEN TO GO? The bowling alley is open 11am to 12am on weekdays and 10am to 12am on weekends. During the school holidays they are open 10am to 12am seven days a week. The bar closes at 11.30pm. TELL ME MORE: For sat nav users the address and postcode is Parc Tawe, The Strand, Swansea, SA1 2AX. Phone 0871 873 3150.